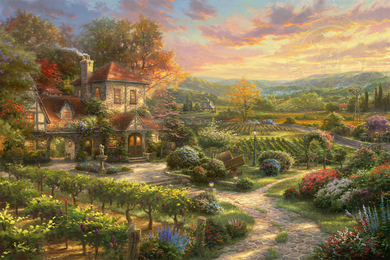 Thomas Kinkade Limited Edition Giclee on Paper and Canvas:"Wine Country Living"
Edition : Limited SN (Standard Numbered) and AP (Artist Proof) Editions. - Select Option from Drop Down Box. Medium: Giclee on Paper and Canvas - Select Option from Drop Down Box. Dimensions (Sizes): Paper and Canvas in 12" x 18", 18" x 27" and 24" x 36"
About the Art: On the rolling hills of this vineyard countryside estate, the scent of crush is thick in the air. Vineyards are bursting, ripe with fruit, beckoning to be picked as fall is fast approaching. The garden is in full bloom, its beauty only surpassed by the tranquil blue-sky lit up in a fiery blaze. We invite you to meander down the cobblestone path and soak up the majestic beauty that Wine Country Living has to offer.